Xi's Anti-Corruption Campaign: Revolutionary Reform or Paper Tiger? When Mao Zedong was interviewed by American journalist Anna Louise Strong in 1956, he used the term “paper tiger” to describe what he thought of American imperialism – powerful in appearance but weak in reality. The same could be said of China’s anti-corruption campaign today. At the end of 2012, Xi Jinping caught the attention of the world by vowing to crack down on corruption in all levels of the government in his inaugural speech as General Secretary. It seemed as though government corruption, which had grown exponentially worse after the partial market reforms of the 1980s, would finally be addressed by Party leadership. However, despite the visibility of Xi’s anti-corruption drive, China’s 2015 ranking in the Corruption Perceptions Index is lower than in 2012, and many have speculated that the campaign is merely a tool for Xi to eliminate political rivals. One of the main criticisms of the anti-corruption campaign is that it does little to eliminate the deeper institutional issues which facilitate graft in the first place. The lack of transparency, weak enforcement of the rule of law, and the central government’s control of the discipline inspection agencies, for example, still pose a substantial threat to current anti-corruption efforts. What has the government done to address these issues? On the surface, there have been many substantive changes. For example, to increase transparency, lower-level inspection committees of the Central Commission for Discipline Inspection (CCDI) are now required to report the cases it chooses not investigate to higher levels of authority. To prevent local officials from protecting their cronies, the central government has adopted the practice of appointing an outsider (someone not native to the province) as the head of provincial inspection committees. It is clear, however, that these new measures merely address the symptoms of a flawed accountability system instead of the root cause. More troubling is that the government treats the centralization of anti-corruption efforts as its main priority instead of promoting true transparency and rule of law. To be sure, the decentralization of the supervision agencies has been an obstacle for anti-corruption efforts in the past. Previously, local discipline inspection committees were under the control of both the central and local governments, which enabled party secretaries to be the bosses of those designated to monitor them. Since the launch of Xi’s anti-corruption campaign, regulations have been put in place to reduce the influence of party secretaries and strengthen the authority of the CCDI. However, it appears that the government believes the CCDI’s reach does not go far enough. Recently, Beijing announced that it would set up new supervision commissions to combine separate government anti-graft forces and expand the number of public servants currently monitored under the CCDI. Under the new supervision system, the functions of party discipline agencies, anti-corruption supervision agencies at all levels of government, and anti-corruption investigations by judicial authorities will be integrated, and the resources of all the agencies will be pooled together. The new supervision commissions – which will work parallel to the CDI – are to be set up in Beijing and the provinces of Shanxi and Zhejiang as pilot programs first, and then implemented nationally later. Still no institutional autonomy: The new commissions will be placed under the People’s Congress but headed by the Party. How likely are these programs to bring meaningful changes? KI spoke with Professor Minxin Pei of Claremont McKenna College about these new supervision commissions and their significance to China’s anti-corruption campaign. So why is China promoting this unsubstantiated, opaque plan and what does it reveal about the future of the anti-corruption campaign? First, the pilot programs may be merely a symbolic gesture to appease popular demand for institutional changes in the anti-corruption apparatus. High-profile arrests may not be enough to justify the continuation of a campaign which – at least in the short term – has actually hurt the Chinese economy. Especially as the initial sensationalism of the arrests has died down and economic growth remains uncertain, the government will need to (at least superficially) commit to institutional reform. Thus, if the pilot programs are eventually implemented nationwide, it may signal that China’s anti-corruption efforts will rely more on strengthening established agencies than “campaign-style” efforts with ideological speeches and televised arrests. Second, the programs will further strengthen the central government’s power. Despite the intention of the commissions to be modeled after Hong Kong’s Independent Commission Against Corruption, the commissions will not be independent entities, but rather effectively under the control of Wang Qishan, Secretary of the CCDI. Wang has been spearheading the pilot programs, which according to analysts are intended to boost his power. Finally, it appears as though the central government does not have a focused plan as to how it intends to restructure the anti-corruption apparatus. Two years ago, the central government set up a another anti-graft agency within the Supreme People’s Procuratorate (SPP), the highest prosecuting body in China, to create additional resources for fighting corruption. 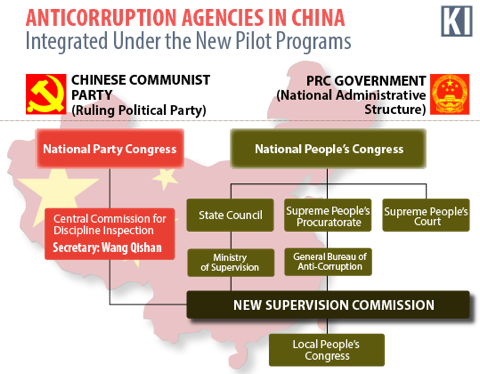 Now, it seems as though the new supervision commissions will take over the functions of this agency along with other anti-graft agencies, and all of their resources will be pooled together. Overall, the pilot programs are little more than a superficial reshuffling of power among the anti-corruption agencies. If the concerns of transparency, rule of law, and institutional autonomy continue to be ignored, reforms like these are doomed to remain paper tigers.